Kulturen der Gefühle in Mittelalter und Früher Neuzeit. Ed. Ingrid Kasten, Gesa Stedmann und Margarete Zimmermann: Querelles. Jahrbuch für Frauenforschung, 7. A recent issue of Querelles, the German yearbook of womens studies, aims at establishing gender as a central analytical category of a historical examination of emotions between the 13th and the 18th centuries. 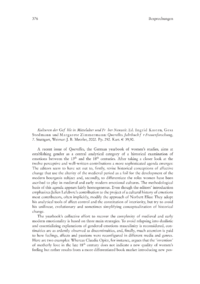 After taking a closer look at the twelve perceptive and well-written contributions a more sophisticated agenda emerges: The editors seem to have set out to, firstly, revise historical conceptions of affective change that use the alterity of the medieval period as a foil for the development of the modern bourgeois subject and, secondly, to differentiate the roles women have been ascribed to play in medieval and early modern emotional cultures.